The Piazza del Duomo, Pisa, is a square that contains four artistically important medieval monuments. They were constructed between the 11th and 14th centuries. 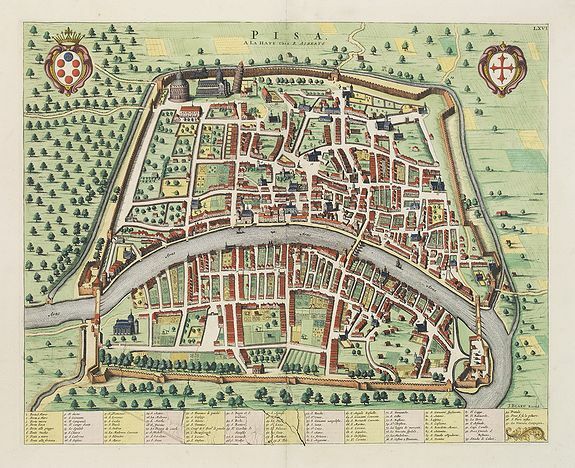 The Tuscan town Pisa used to have a fleet that reigned the Mediterranean Sea. Nowadays its Tower is known worldwide. This marble building is leaning over, and has always been. Pisa native Galileo Galilei is believed to have formulated his theory about the movement of a pendulum by watching the swinging of the incense lamp (not the present one) hanging from the ceiling of the nave of Pisa's cathedral. He also had dropped balls from the Leaning Tower to demonstrate that their time of descent was independent of their mass. Campo dei Miracoli, Field of Miracles - what a name. But the green lawn in northwestern Pisa, with its marble medieval monuments, does deserve it. The leaning tower of course is the most famous attraction here. The beauty of the neighbouring 11th century cathedral and baptistry is stunning though. They dwarve the tower, both in size and elegance. For a steep 15 euro (and some patience) you can do yourself the favour of climbing the tower. It takes about 300 marbles steps to get to the top, where large bells can be found on the edges of the highest platform. When you're on top you can sense that the surface under your feet isn't particularly straight. It's not called the leaning tower for nothing. The Piazza del Duomo in Pisa is one of the most famous sites in Europe, entirely due to an aesthetically designed tower that was poorly engineered. Thankfully there are hordes of tourists willing to prop the poor tower up with a carefully positioned hand (or hands). 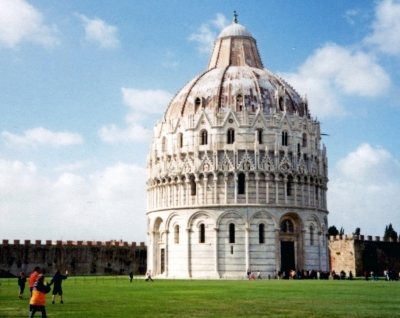 I visited Pisa with my brother on a blustery day in the fall of 2003. We arrived by train from Florence, and noted the wind was so strong that the Arno River was almost flowing backwards. Despite the cool weather, the Piazza dei Miracoli was rather crowded with visitors, which made it a bit of a miracle to get pictures of the tower, cathedral, and the perfectly round baptistry with only a few other tourists in the background. I had hoped to go up the tower, but it was closed; I can't remember whether it was due to the wind or to construction. My brother was a bit tired of cathedrals and museums after his first week and a half in Europe, so we wandered around the square for about an hour before heading back to Florence. The architecture of the three main buildings in the piazza was incredible, and definitely worth a visit. Maybe someday I'll return and get to climb up the tower and tour the cathedral and baptistry. Logistics: The Piazza del Duomo is small enough that it is extremely easy to walk around; the piazza may be reached by bus or by an approximately twenty minute walk from the Pisa train station. Pisa is one of those WHSs that are best visited in the off-season in order to avoid the crowds. As such, I traveled there on a weekend in December 2014. 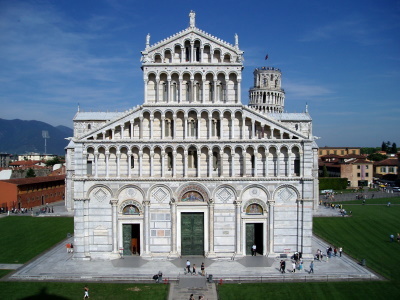 If you only go inside one of the buildings on a visit to Pisa you will be pleased to hear that my advice is to go with the free one: the cathedral. 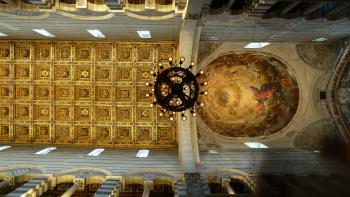 It was begun in 1064 and constructed from marble. The ornate pulpit pictured below is a work of Giovanni Pisano, and is thought of as one of the most significant works of all medieval sculpture. Looking at works such as this that Michelangelo’s claim comes to mind that sculpture is the highest form of art. Another highlight of the cathedral is the Ascension of the Virgin painted in the dome. As with the Sistine Chapel, this work exploits the geometric properties of a church’s dome to heighten the portrayal of Mary ascending to heaven. The large Christ Pantocrator mural in the cathedral is a reminder of the building’s age. This depiction of Jesus as a learned and omniscient deity is particularly prevalent in Byzantine-era church buildings. We next went into the Baptistry, which houses a cavernous space, with pride of place given to its baptismal font. Inside the Baptistry is another Pisano pulpit – this one by Giovanni’s father, Nicola Pisano. Its legs rest upon lions, which was a touch I liked. The next day we went back to the piazza to check out the leaning tower and the cemetery. I wouldn’t really recommend paying the €15 or so that it costs to go up the tower, as it is best appreciated from the outside. One cool experience you do get for your money, though, is the very noticeable feeling of lopsidedness upon entering the tower’s entrance. This is one of the most iconic sites on the whole list, one of the places I always reel off when asked "so what places are world heritage sites then". Alas it seems its fame is due mostly to its shortcomings, leading to some QI style remarks about how prevalent leaning towers are in Italy, or how a town in Germany has one that leans much more. The focus on the campaniles vertical issues does somewhat miss the point though. The 'Field of Miracles' is one of the most astonishing ensembles of Romanesque architecture in Europe. The long wait and high fees for a climb of the tower rather put me off so instead we headed to the baptistery and cathedral. We were lucky to be the last people to enter the baptistery before a demonstration of its marvellous acoustics, which was a thoroughly enjoyable way to start our exploration. The well proportioned but slightly bare interior did offer lovely views of the surrounding marvels. My real highlight though was the cathedral, the magnificent bronze doors hid a rather impressive interior with an impressive gilded wood ceiling and innumerable high quality art works. With all the focus on the bell tower it was rather surprising to see such a high quality site right next door. Yes the notorious leaning tower did bring vast crowds, especially in early august, and yes many people were there only to have their photo taken 'holding it up', but I still found it a very worthwhile visit. Pisa itself was a nice town by Italian standards (thus it would be outstanding in most European countries) and de'Coltelli by the river served magnificent gelato. It also has an airport very close to the city centre, but it wasn't necessarily as easy to get there and back as it perhaps could have been. Our swift trip around Pisa was rather rewarding and the astonishing charms of one of Europe's most beautiful architectural ensembles easily overcomes the vast crowds and shortcomings of the travel infrastructure. There is much more to Pisa than some dodgy foundations and taking a step back to peer through the crowds reveals something of real charm. I visited this WHS in September 2006. Piazza del Duomo houses 4 masterpieces of medieval architecture: the cathedral, the baptistry, the Leaning Tower and the cemetery. Climbing The Leaning Tower, one of Italy's most famous landmarks, was the highlight of my visit and a really unique and strange experience. The visit was wonderful! Though I did not climb the Tower,I visited the Duomo and I loved every moment. The architecture amazed me. Hi, I had a great time in Pisa, impromptu classical performances in the bell tower, a Bernada Fink concert,The locals, walks in the nature reserve, resturants, roman ruins, the light on the stone of the duomo ,colours, food, the cosmopolitan atmosphere, surrounding Tuscany, the list is endless I don't know about one day, for me one month wouldn't be enough. Once you get past the cheap vendors, peddlars and pick pockets lining the approach to the Field of Miracles it is a truly beautiful place to see. All four white marble buildings in one large open area is a unique setting. Pisa needs to get the cheap vendors out of this area to make it what it really could be for people visiting from all over the world. I don't recommend it to friends visiting Italy because the vendors and pan handlers have ruined this priceless gem of art and architecture. Shame on the people of Pisa for letting this happen to their own heritage. The first time I saw this place I truly understand why the Italian affectionately named it "Piazza del Miracoli". The three white marble buildings were situated in the middle of green lawn under the blue sky. I was impressed by the colours of white from marble, green from grass, blue from the crystal clear sky under the tuscan sun and brown from the surrounding brick wall. After walking in the mazed-like small old town, I finally saw the famous "Torre Pandante", which is the most beautiful belfry I have seen. Even though this belfry was constructed for religious purposes, many people including me recognized it from the science schoolbook, and it's unusual lean structure. People around the world call it " The leaning tower of Pisa". As one of the symbol of Europe, millions of tourists come to admire its unique appearance every year. For myself, the leaning of the belfry is not an important reason, but it's the marvelous of the whole complex, which is included the cathedral, the baptistery and the belfry, that make me to stun every time I have been there. The beauty of this place is deservedly its name "The place of a miracle"
Really disappointed, after seeing other sites in Tuscany. There is the tower, the Piazza, and an EMPTY duomo, as all the art were lost as the Pisans lost a war to the Florentines(?). Now it's just a tourist strip selling souvenirs, and thousands of stupid American tourists taking pictures leaning towards the tower. Better plan the day to spend four hours in Luca (on the train from Florence), and just one hour in Pisa, and go right back to Florence. The leaning tower of pisa was a great place to be. Ut was quite a rainy day so overall it wasnt really fantastic. though i was able to climb those 300 marble steps all the way to the top. It was worth all that, the view was really over whelming. The Leaning Tower of Pisa must be one of the most famous monuments in the world, and going to this city gives you a distinct sense of déjà-vu - I must have seen this thing before! Well, apart from the Piazza dei Miracoli, Pisa doesn't have that much to offer and is just an average city (especially because it has lost its once vibrant seaport centuries ago), but the piazza is really great and one of the grandest architectural ensembles you will see anywhere. 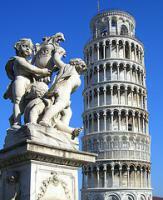 So, even if many Italian cities have their own campanile, you should go to Pisa to see the real thing. After all the hype that the city receives, Pisa is a disappointment. The entire Piazza del Duomo is a giant tourist trap, and I still don't understand why this particular leaning tower, of all the leaning towers in Italy, gained such a reputation. I will say, however, that the Baptistery is interesting, particularly when the ticket collector performs an impromptu concert to demonstrate the perfect acoustics. Beyond the Piazza, Pisa offers little to the curious tourist, making even a day trip a bit underwhelming. I was thrilled to see the Tower after hearing so much about it and seeing photos all my life. My husband didn't want to spend the money to climb it, but he changed his mind. We weren't sorry--ther were fantastic views, and we could very much sense the leaning while we climbed. I ended up climbing many towers in Tuscany because this was such a great experience. I visited Pisa in August 2004. The first view of the tower was very exciting, probably because it is such a famous monument. I didn't climb the tower (it is now 16EUR), but greatly enjoyed the whole Piazza, the museums and especially the Cathedral. It's well worth getting the combined ticket (just EUR10.50) to see all that the Piazza del Duomo has to offer. I visited Pisa in August 2001. Then it was not aloud to climb the tower, but it was interesting to see the works of reinforcement ongoing there. To include the Piazza del Duomo as a spatial composition, by extending the core zone to all three visual axes that lead to the square. Galileo Galilei: Is said to have dropped balls of different masses from the Leaning Tower to demonstrate that their time of descent was independent of their mass - but probably didn't!. 591 Community Members have visited.